Tippmann X7 Phenom Military Replica Compact Paintball Sub Machine Gun is fast, lightweight and easy to wield. The X7 Phenom CQB features a versatile retractable stock, precision 30mm red dot and vertical grip for awesome control for any combat situation. 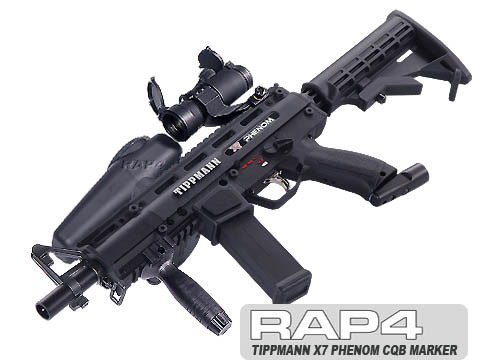 The Tippmann X7 Phenom CQB is designed for Close Quarters Battle: room entry and room clearing. This gun is designed to be compact and accurate for fast action. It comes with a vertical grip for better control and maneuverability, and a 30mm red dot scope for quick target acquisition. The X7 Phenom CQB is the best choice for fast and furious paintball and is an excellent replica of something you would see with SWAT teams and special forces units. The Tippmann X7 Phenom CQB is perfect for a frontman or midman position on the paintball field. The X7 Phenom may be lightweight and small for easy manuevering but this marker still packs a punch! The CQB comes with the mechanical version of the Phenom as the base marker. You can easily upgrade this gun to an electronic trigger featuring a three position selector switch - with the third position having five firing modes from single shot, semi, burst and fully automatic! If you want your X7 Phenom Sidewinder Sniper marker to come with an e-trigger, simply choose this option from the drop down boxes below. Also consider upgrading to the Flexi-air buttstock in the options below. This marker will fit into a medium sized - small marker bag, but you might also consider ordering the large bag to carry more essential paintball gear... pods, different optics, gloves, paintball goggles, etc. Many players love the X7 Phenom CQB as an extra - carry this gun as a secondary marker around your torso with your sling; pull it out for a dangerous spray of violence in the midst of serious action! *Some assembly may be required.